The SMU Teaching Excellence Awards are given to recognise and value the importance of teaching as a complex and multi-faceted activity. The teaching awards for undergraduate programmes are given to faculty for their contributions to peer development, student development, innovative instructional approaches, effective pedagogy and course design. The teaching awards are by no means a one-time acknowledgement of excellence. For the recognised, their value to and influence on the academic community will continue to build from there. Award recipients can expect to be called upon to contribute to SMU’s drive towards quality teaching as facilitators, peer coaches and faculty champions in CTE’s initiatives. Award nominees may likewise be invited to contribute in similar manner. There are six categories in the SMU Teaching Excellence Awards for undergraduate programmes. The Excellent Teacher Award recognises outstanding faculty members who have shown commitment in promoting excellence in teaching and learning, to enhance the quality of classroom experience. The candidate would demonstrate up-to-date knowledge of the field, employ exemplary teaching skills that encourage student engagement, and foster the holistic development of students. The Innovative Teacher Award recognises faculty members who have made significant contributions to promoting new ways of teaching that have an impact on enhancing learning. The candidate would introduce, develop, and deliver creative approaches to teaching and learning. The Most Promising Teacher Award recognises junior faculty members who have shown outstanding potential and exemplary teaching in delivering the SMU pedagogy. The candidate would display most of the qualities described in the Excellent Teacher category. The Outstanding Teaching Consultant / Adjunct Award recognises adjuncts and CEC teaching consultants who have made a significant impact on students in terms of their commitment to deliver the SMU pedagogy. The candidate would actively contribute to the transfer of expertise from industry or his/her specialised domain to students' learning. The Honour Roll was introduced in 2016 to recognise faculty members who have received at least three SMU Undergraduate Teaching Excellence Awards. Click here for the eligibility and criteria information for each award category. 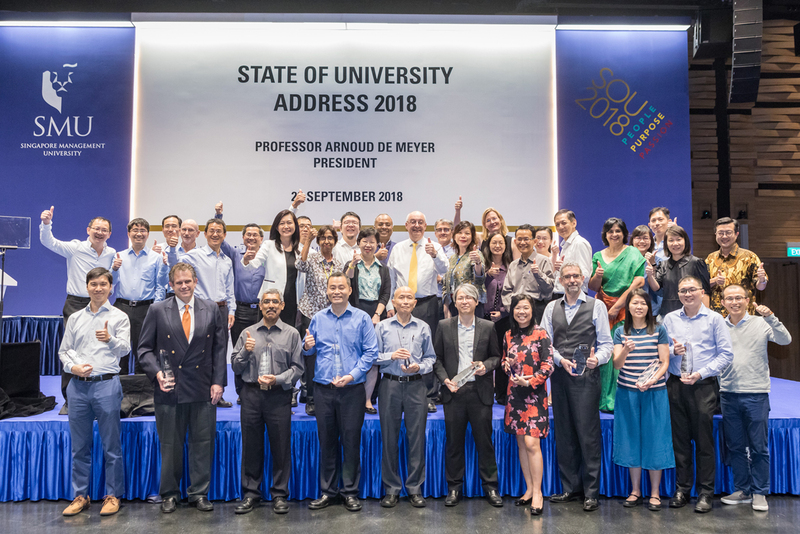 Nominees and recipients of the SMU Undergraduate Teaching Excellence Awards, the Teaching Excellence in Postgraduate Professional Programmes Award, and the SMU Executive Development Award with Senior Management at President's State of University Address 2018.